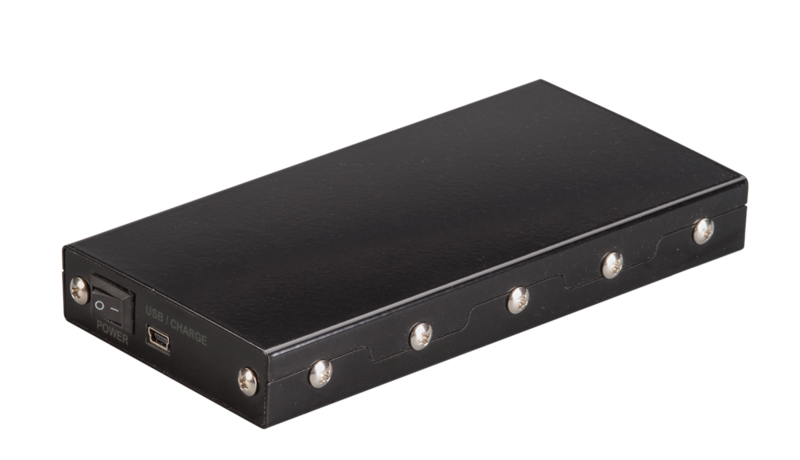 Arinst SSA is a panoramic spectrum analyzer designed to display signal spectrums in the frequency range from 25 to 5999 MHz. The analyzer finds the amplitude and frequency of spectral components of the analyzed process. Spectrum analyzer is able to find the signal amplitude for all widely used technologies: Wi-Fi, 2G, 3G, 4G, LTE, CDMA, DCS, GSM, GPRS, GLONASS and others. Arinst SSA is primarily intended for field operation. The device is rugged and light with low energy consumption. It enables service centers and maintenance teams to perform on-the-spot HF analysis for commissioning and repair works. 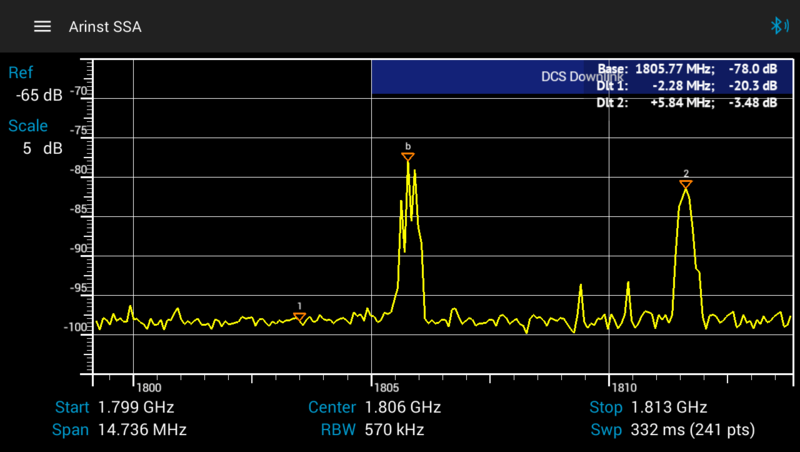 Moreover, the spectrum analyzer is a perfect solution for repair workshops and radio amateurs. 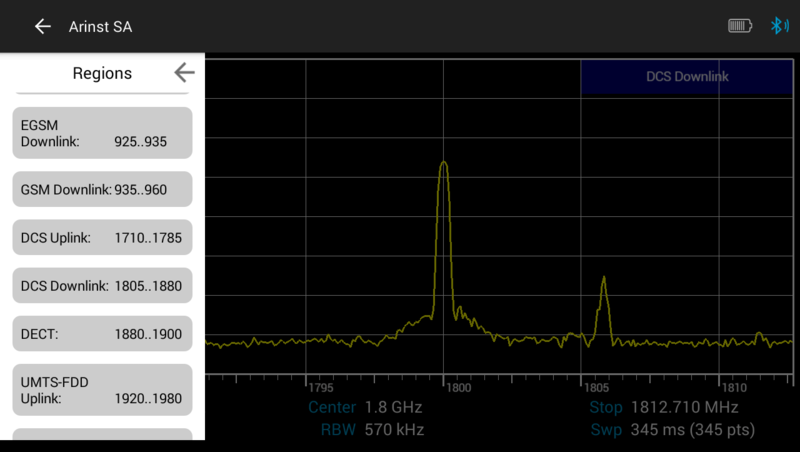 The spectrum analyzer is a portable device that is connected to the measured circuit and has an independent power supply. You can download the analyzer software to control by PC or laptop from here. There is a possibility of device control using API. After the command completes, the device Arinst SSA will send the client device (microcontroller, computer, mobile device, etc.) a message containing the measured values of the amplitudes for the given frequency values. The user can record the received data to a file, database, etc. Using this API users can customize automatic measurements and use the spectrum analyzer Arinst SSA in their system. The API works in any programming language that supports work with input-output ports (Java, C, C++, C#, Python, Assembler, etc.). An example of using the API can be downloaded from here. 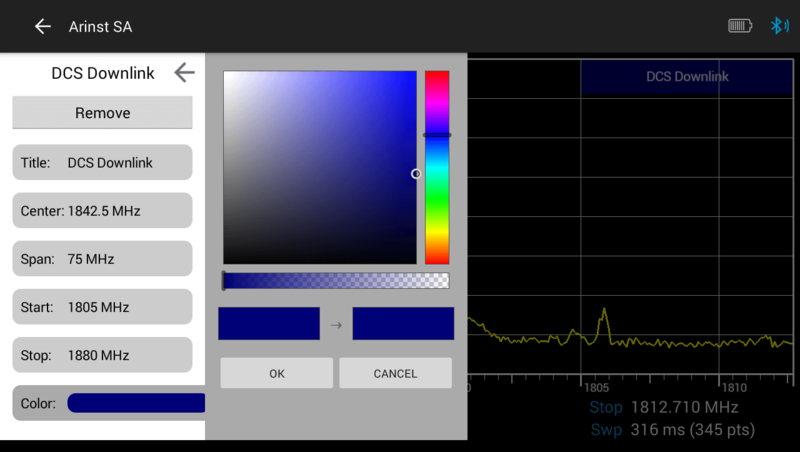 Displays the signal spectrums graphically and sets up the frequency range and reference limit. Sets up and manages absolute and relative (delta) markers. Searches one or a series (up to ten) of maximum values of the signal in the instantaneous or tracking mode. Sets and stores unique identifiers of the frequency ranges - domains. 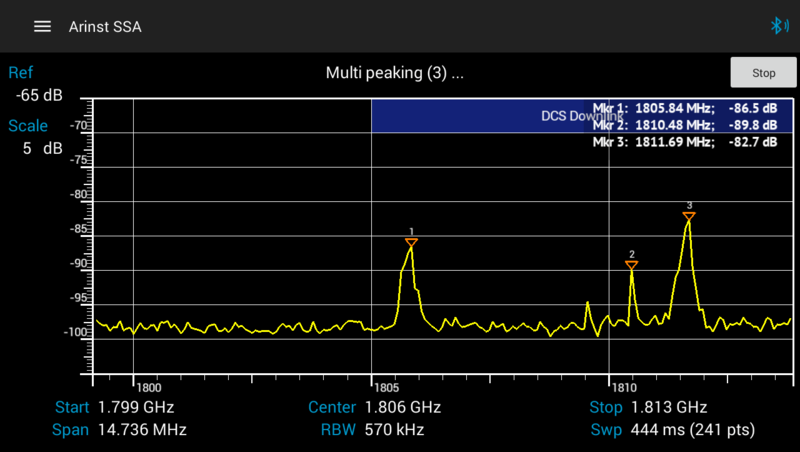 For instance, a domain titled «DCS UpLink» can be set for the range 1710-1785 MHz. Additionally, working frequency domains can be set for each operator. This option considerably facilitates the HF analysis and identification for the signals of conventional technologies. 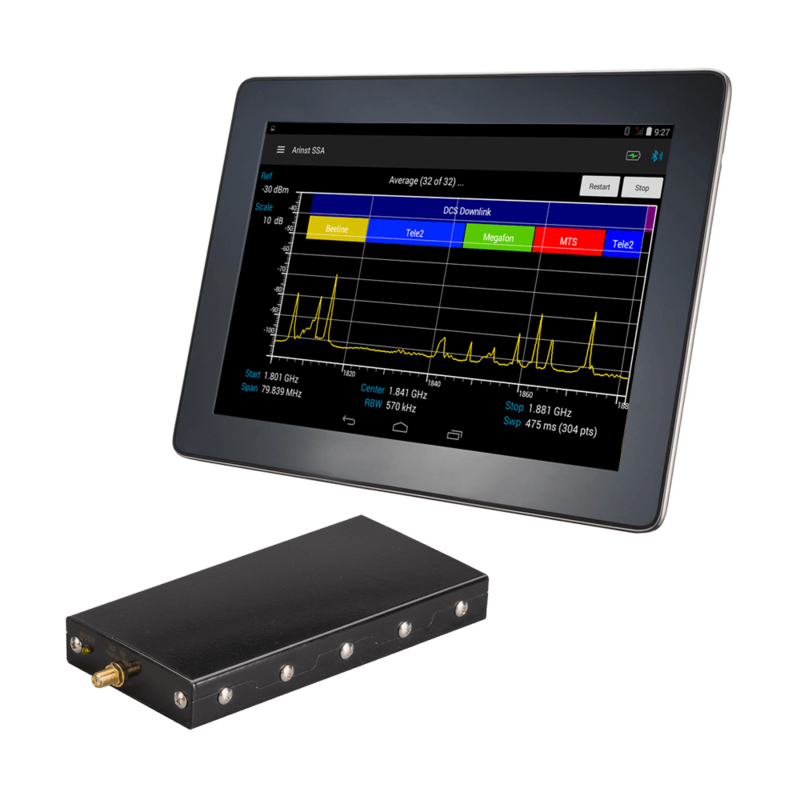 Has pre-set domains and is able to store the domains in a file and share them with other devices to control the spectrum analyzers Arinst SSA. 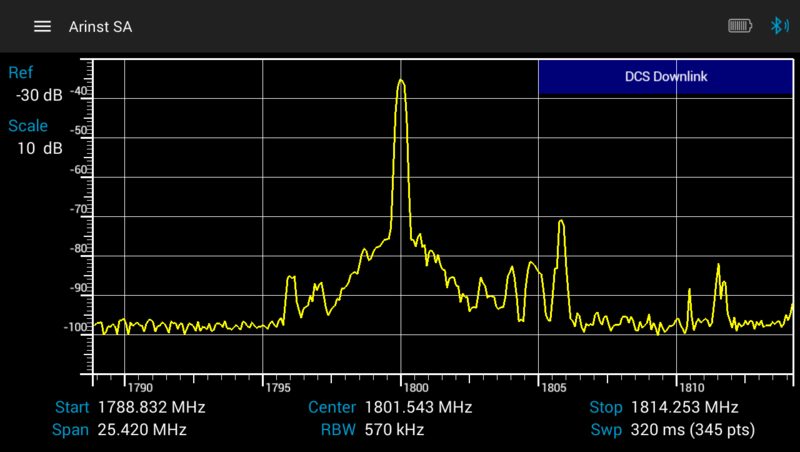 Has the tracing mode that generates a signal spectrum averaged by a number of measurements. In addition to the average spectrum, extreme values and moving average values can be displayed as well. 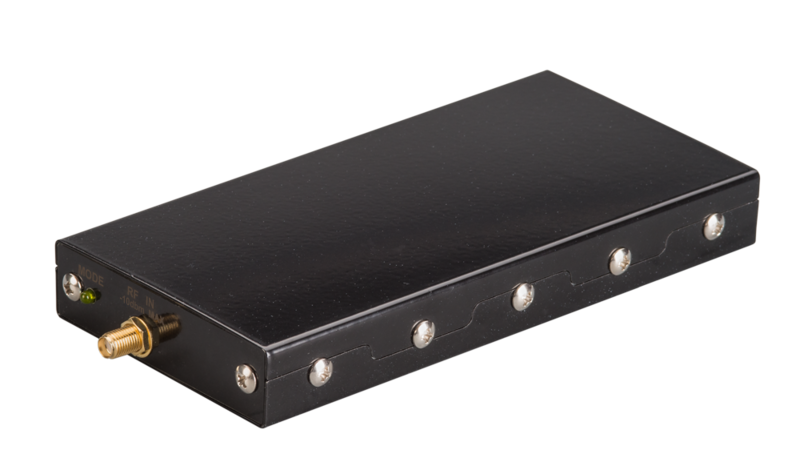 Stores the settings for the spectrum scanning (band limits, attenuator value and others) for a quick and easy switching into the required measurement mode. 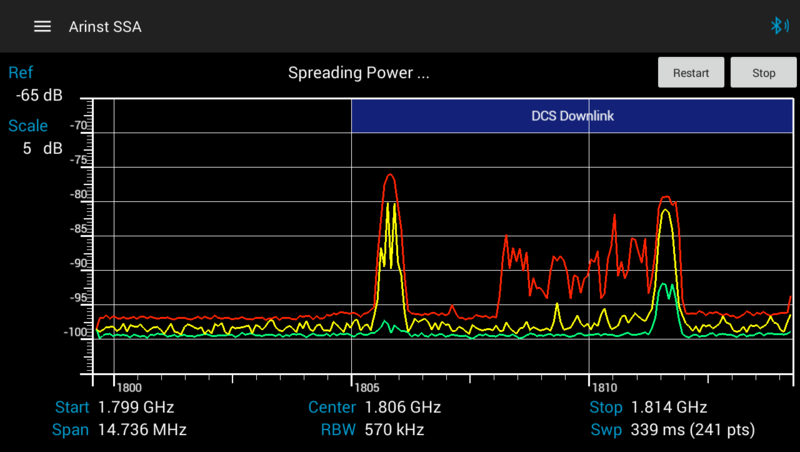 Stores the spectrum signal with markers for later analysis. 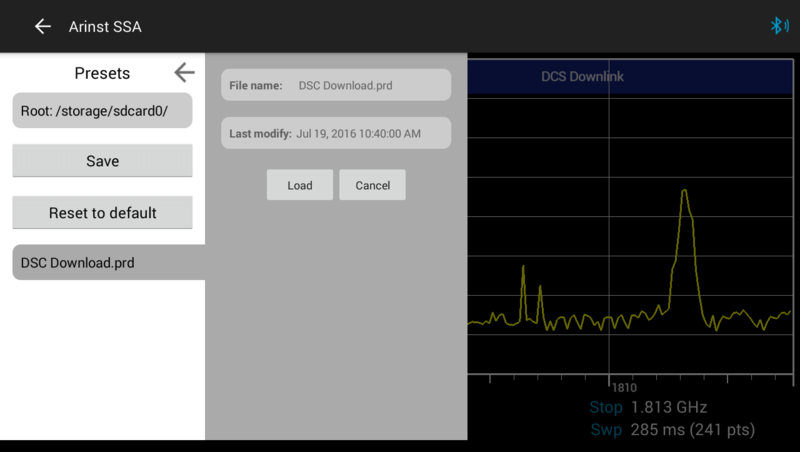 Then the stored graph can be opened in any Android device with the application «Arinst SSA» (in this event you don’t need to have the spectrum analyzer at hand) or use the table editor to convert the graph into the required type of data display. Smartphone or tablet under the Android’s 4.0.3 control or higher. Use your Android powered device in order to control the equipment. The device is implemented in one body, while the equipment for its control is built in another. 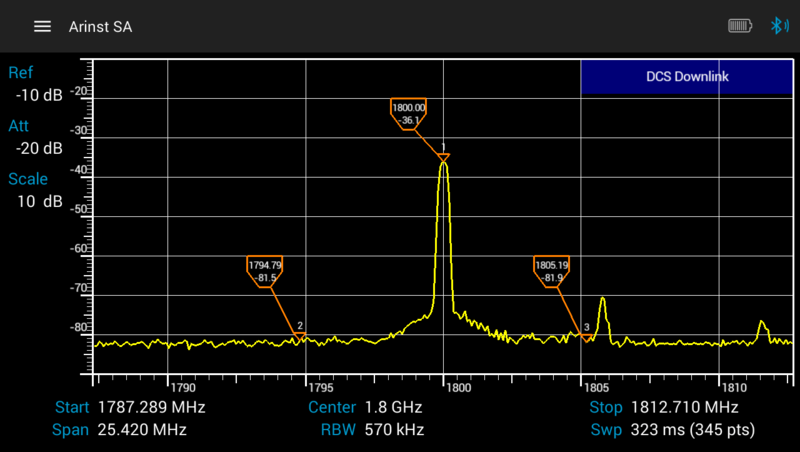 It has been done in order to make the spectrum analyzer much simpler and more available. Also, use your laptop or computer for controlling the device. External attenuation network. The maximum measured input power, which is supplied to the device, is limited by +5 dBm. If it is necessary to measure a larger value, each user of the device has to select the necessary attenuators on one’s own. Set of the super-high frequency adapters. The spectrum analyzer Arinst SSA is not a measure gauge, as it does not have an approved pattern of the measuring equipment. The approval of pattern of the measuring equipment has had a negative effect on the availability and price of the device. For this reason the spectrum analyzer is officially considered a field indicator. However, the device fully meets all technical requirements. Each device is calibrated against the power and frequency. Overview of the software and Arinst SSA training.